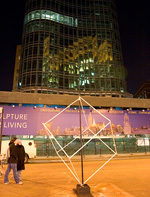 The “jelloCube” was a reaction, a placeholder, and a statement about public contemporary art in New York City. Astor Place is home to an assortment of historical and significant landmarks. 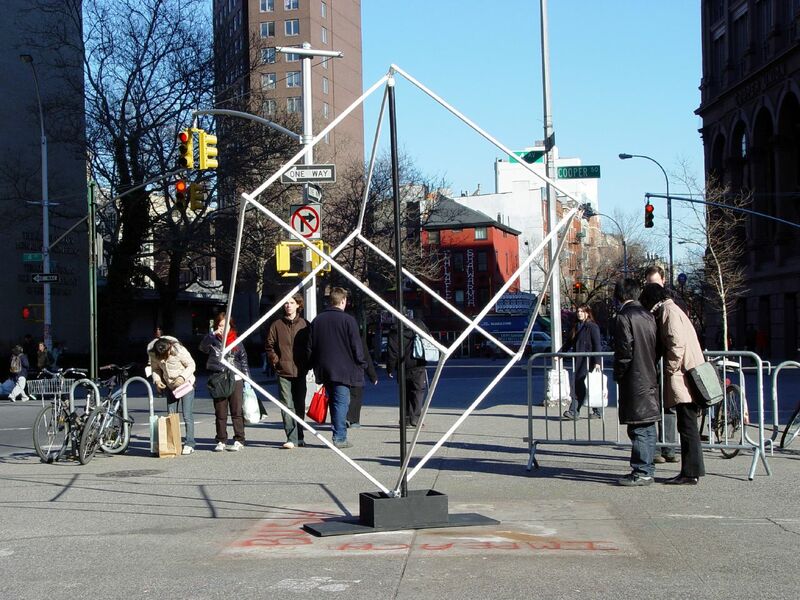 Early subway portals, the Cooper Union, as well as the quazi-physical border of NYU all rest here, and up until last Wednesday, so did the “Alamo”, an 8’x8’x8′ rotating sculpture created by Tony Rosenthal. In 1967, Bernard “Tony” Rosenthal, installed “Alamo” on the corner of Astor Place and 8th Street. 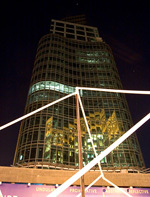 It was the first and last permanent public piece of commissioned Contemporary Art in New York City. Though Rosenthal installed several other iterations of “the cube” throughout the country, most notably “Endover” at the University of Michigan, “Alamo” has come to signify Astor Place and Exist as a cultural New York City Icon. On Tuesday, March 8th, 2005, the New York City Parks Department removed “Alamo” to clean and repair it as it was not rotating correctly. According to trusted news and personal sources, the NYC Parks Department did not notify Rosenthal of its removal, Cooper Union, nor the NYC Police Department. Many New Yorkers felt an immediate void as we collectively wondered what happened to our beloved “cube”. By Wednesday morning, news spread though the Village Voice’s Jen Snow, the Gothamist, and via Flickr, that “Alamo” had been removed for repair. There was no warning, no news, or reason that was given to the public, other than to the few passerby’s who documented the removal at 6AM on Tuesday the 8th of March, 2005. As I walked by late Wednesday evening to witness the truth for myself, I felt the immediate void that was left by the disappearance of “Alamo”. I had an idea, and the next day I released the idea to my fellow students at the Interactive Telecommunications Program at NYU. 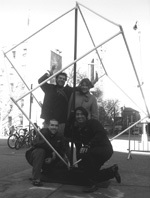 By the next day, a small team consisting of myself, Jeff Gray, Emily Conrad, and Jeff Galusha resolved to remake “the cube”. Our initial reaction was one of concern over local neighbors removing the cube for political or economic reasons, and we began to brainstorm how we could show our support for the missing art. “jelloCube”, affectionately named, was a small-scale skeleton of the former installation, hollow and void of any really solidity. Also void of any comfort and protection the old cube offered, and with limited interaction it could react to from the public, the “jelloCube” stood as a simple outline of a piece of art we wanted to give credit to. It short, it was a testament to the artist, a testament to the city, and a simple object for the public to enjoy while the original piece of art was cleaned, restored, and returned to us all. -Mohit SantRam, Jeff Gray, Emily Conrad, and Jeff Galusha.